Black Stump is an old Australian expression. The expression is well known in Australia and has even given name to wines, restaurants, cartoon series and festivals, but the original meaning and the history of the expression are not fully known. Its straightest meaning, though, is that anywhere 'beyond it' is the remotest outback, and on 'this side of it' is the 'civilisation'. The general belief is that the expression started during the 1800s with early surveyors or mail carriers, who used fire-blackened tree stumps as markers in the outback. So for starters they were real stumps, and it's believed that during the following century the expression became to be used about anywhere remote, not necessarily where there was a tree stump marker. There are a few different towns in Australia that claim the fame as the places where the expression originally started. Coolah in New South Wales is apparently next to an area whose Aboriginal name means 'place of a burnt stump'. Merriwagga and Gunbar in New South Wales claim that the husband of Mrs Barbara Blain, who burned to death in an accident and is buried in Gunbar cemetery, said that his wife had looked like a black stump when he found her. A nearby waterhole also got the name. 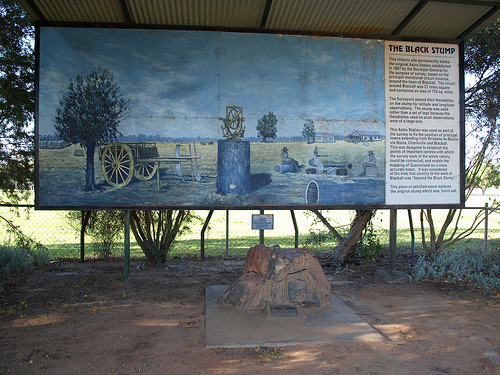 Blackall in Queensland claims that some early surveyors, in their work of mapping the outback, used a stump of petrified wood as part of their equipment. The outback west of Blackall was largely undiscovered at the time. 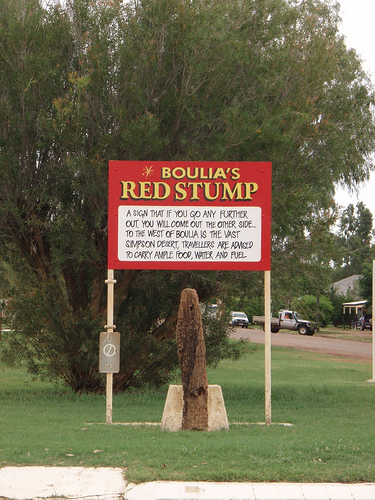 Boulia in western Queensland has their own version - the 'Red Stump'.